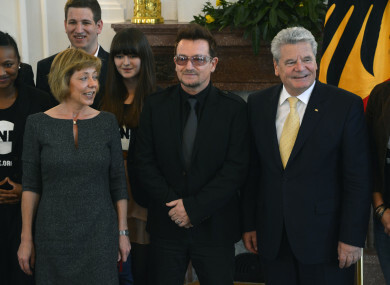 Bono and ambassadors of the charity pictured in Berlin in 2012. THE ONE CAMPAIGN, an advocacy organisation co-founded by U2 frontman Bono, is acknowledging “an institutional failure” after an internal investigation revealed a pattern of abuse and misconduct among leadership in its Johannesburg office between 2011 and 2015. The nonprofit, launched in 2004, focuses on fighting poverty and preventable diseases, particularly in Africa. “Actions. Speak. Louder.” is its official motto. In a letter to members posted on its website yesterday, CEO Gayle Smith said that between late 2011 and early 2015 staffers in South Africa were bullied, berated and belittled by managers. Employees told investigators that a supervisor made them work as party hostesses at her home on weekends. Smith, who joined the organisation in March 2017, said One Campaign learned about the allegations after the employees, who had all since left, shared their grievances on social media in November of last year. Smith wrote that the organisation then launched an internal investigation. The sexual harassment allegations are so far uncorroborated, Smith wrote, but she stressed that the organisation does not “discount any allegation”. Investigators were able to substantiate claims of bullying and harassment that included instances of the Johannesburg manager calling her staff names including “idiot,” ”stupid” and “worthless”. “The overall evidence from our investigation was sufficient for me to conclude that we needed to own an institutional failure and ensure that our organisation has in place the systems, policies and practices needed so that this never happens again,” Smith wrote. Smith said in an interview with The Associated Press that both the employees who alleged the abuse and all leadership and executive management involved are no longer with the organisation. The letter comes on the heels of reports of misconduct within other UK-based nonprofit organisations. Anti-poverty charity Oxfam recently came under fire over allegations that staffers working in Haiti following a devastating 2010 earthquake hired prostitutes. The deputy executive director of UNICEF, a children’s aid foundation, recently resigned after he was accused of acting inappropriately toward female staff while working at a different charity, Save the Children. “We’ve got an obligation to find out how we do better,” Smith said. Email “Advocacy group - that Bono co-founded - admits staff were bullied and harassed for number of years”. Feedback on “Advocacy group - that Bono co-founded - admits staff were bullied and harassed for number of years”.